I remember when I lived in a tiny studio apt and I made all my art sitting on my bed/couch because I didn’t have a table or even enough room on the floor. All my supplies were in bags and shoe boxes. I am glad for real tables now. But it was still a fun time of art making. When I was finally able to afford a one bedroom apt, I kept the same bed/couch in order to sleep in the living room and made the bedroom my art studio. This allowed me to work much larger. I was reminded of these small work spaces where I made it work, despite it all, when I read today’s episode of The Pulse. Artist Kelly Kilmer, talked about working on the floor and shared a pictures of baggies filled with supplies. It almost makes me nostalgic for the past. 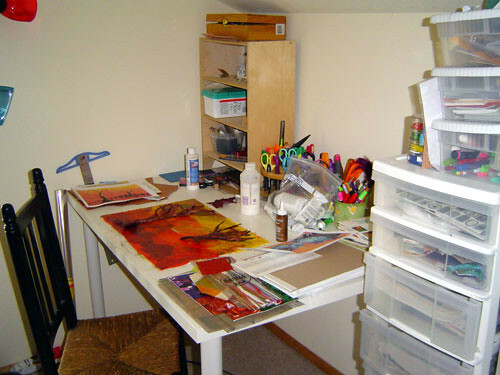 Usually, I am envious of the art studios I see when people share pictures of their spaces. Wood floors, super organized shelves and drawers, clean walls with good lighting. But when I think of the spaces I used to have and the space I have now I need to consider myself fortunate. 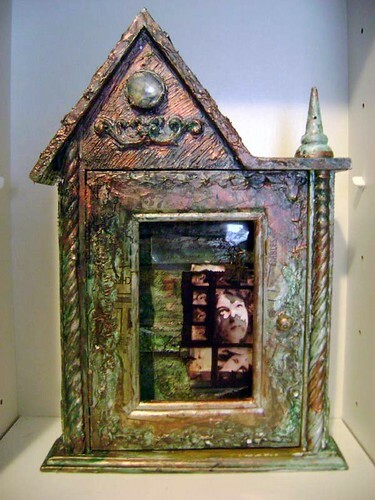 If you would like to see the studios of some great artists then check out the Pulse! This entry was posted in The Pulse and tagged art, Fantastic Artsy Types, questions, studios, the altered page, The Pulse on September 16, 2008 by Sheba. Visual Journals… now that is something I need to do more of. It seems that since I have been blogging, and writing online, I have done less journal writing on paper. This page is probably from 2003. I like the thoughts and reflections, as much as the images that I put together along with the meaning that they both hold for me. The word interesting has a lot of both positive and negative meaning for me, so it is very weighted. But I find myself using it a lot with my students… when I am not sure I can come up with something positive and constructive to say, it slips out. This entry was posted in The Pulse and tagged art, books, collage, interesting, journal, Playing Favorites, questions, the altered page, visual journal, writing on July 25, 2008 by Sheba. The Library, originally uploaded by v_stamey. The library I WISH I had…. Next to faces, I think words or text in art is one of my favorite subject. But I think that is for another entry, this is about BOOKS! which is just as good. I love books! I love reading them, collecting them, altering them and making them. I have taken classes on book binding, participated in Altered Book round robins and tip-in swaps. I have even taught and shared the art of altered books with my students. 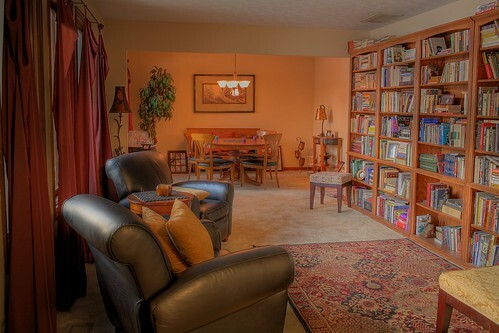 I dream of having a house where I have a room that is JUST for books. I picture it as one of those turret round multi-story rooms with a ladder to reach higher levels of books. So anyways… here is my pick for Seth’s Playing Favorites: the library. This is a mixed media book that I made inspired by DJ Pettitt. I bought a kit from her that included some images, transparent and white papers and fabrics along with a mini instruction booklet on how to do image transfers. I was later able to take a class from her at ArtFiber Fest in 2006. As much as I love to make paper books, I am more interested now in making fabric books and journals. You are sure to see some of these in the near future! This entry was posted in The Pulse and tagged art, books, collage, Fiber Goodness, journal, love, paper, Playing Favorites, questions, sewing, the altered page on July 24, 2008 by Sheba. Inspiration/ Meaning: These pieces were created as part of the Saving Face series. I wanted to focus on the personality and emotional expression of the face. This piece was made as I struggled with removing personal drama from my life. 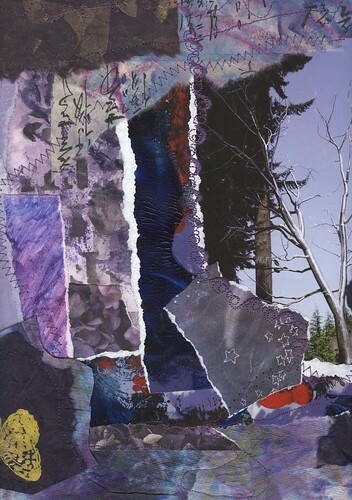 Creation: Mixed Media Paper & Glass Collage; This piece was created with layers of handmade papers, sewing patterns, and book pages applied to glass. Created in 2002. This one is called, “The Drama Queen” actually I think it originally had a longer title, something about the demise of the drama queen went without notice or something about basically begging for attention in all the wrong ways and for all all the wrong reasons, but more cleverly worded. My titles have often been long, poems or stories even. Sometimes I even come up with the title first and work my way towards that in my art. This one, and all of the ones in this series, started from photographs that I took of some friends and family. I purposefully had them make dramatic emotional faces. Thinking about this really makes me want to get back to this series! hmmmm… food for thought. 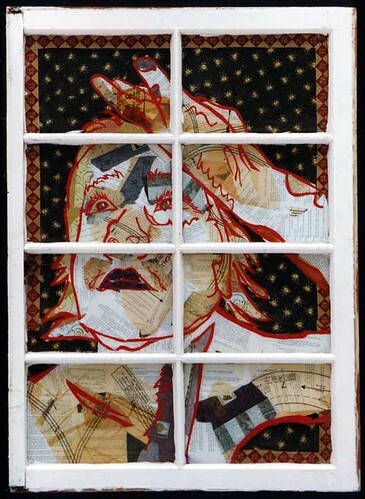 This entry was posted in The Pulse and tagged art, collage, emotions, faces, Playing Favorites, questions, Saving Face, the altered page, windows on July 23, 2008 by Sheba. I haven’t done a ton of assemblege so I think my favorite is my most recent. This was created in Michael DeMeng’s class at artfest 2008 and I talk more in detail about the experience here. This entry was posted in The Pulse and tagged art, collage, Playing Favorites, questions, sculpture, the altered page on July 22, 2008 by Sheba. I have a ton of feeds on my google reader right now, so picking just one blog is tough. One of the things I do like to do is check out the favorite blogs of other people… often I end up on a trail of interesting blogs and get lost for hours in exploring. One that I found recently that is great for this time wasting activity is Quilting Bloggers. Websites I always go to is easier. Flickr is at the top of my list, to see pictures from family and friends as well as participate in photo and art communities and challenges. 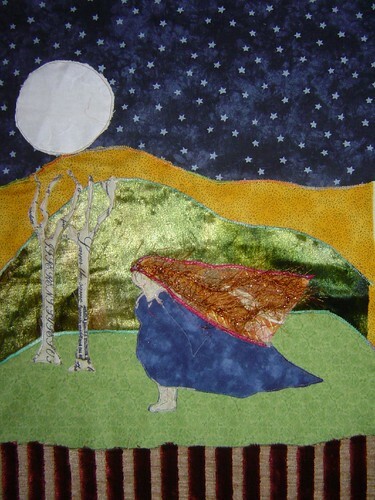 This entry was posted in The Pulse and tagged art, blogs, flickr, questions, quilting, the altered page, The Pulse, websites on July 21, 2008 by Sheba. 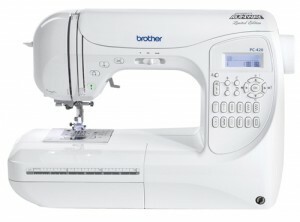 I think right now that would be my sewing machine or my computer… or perhaps my camera. I pretty much use them all equally but for different purposes. This entry was posted in The Pulse and tagged art, questions, sewing, the altered page, The Pulse, tools on July 20, 2008 by Sheba.